Along with 2015, reconstruction of Stadio Friuli has ended. And so did an era of the old name. From now on the stadium will be named Dacia Arena, just as it was rumoured for a long time. Yesterday’s announcement by Udinese that the revamped stadium will be named Dacia Arena came as no surprise to fans and journalists. After all, Dacia has been a major sponsor of Udinese Calcio since 2009. While details of the agreement were not revealed, it’s certainly a partnership that was anticipated. The new name’s debut will come on January 17, when Udinese meet Juventus in Serie A. On that day, too, the south grandstand will also be opened for the first time, allowing the stadium to reach full capacity of 25,000 (decrease from 41,600). Construction is thus finished, only some hand-over procedures are still ongoing. 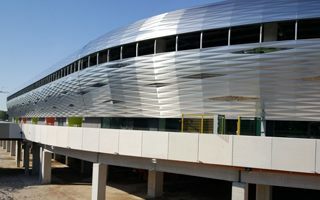 Although it should be said that about 200 travelling fans of Atalanta Bergamo already tested it on Wednesday, being the first fans to ever use this just-finished piece of Dacia Arena. Interestingly, the away section in Udinese is segregated from others with entirely transparent glass instead of fences, making it seem almost not separated at all. This, but most importantly wide accessibility for disabled supporters, is why Udinese claim it’s Italy’s first stadium without barriers. Dacia Arena will have only one grandstand of the old Stadio Friuli, of course the main western section with iconic concrete roof. It’s not as much of a landmark now that most of the stadium is covered with diamond-patterned façade, but remains a distinctive feature.